Fact & Fiction about Support for Bears Ears | RANGEfire! According to a recent Op/Ed in the Salt Lake Tribune, new poll shows that the majority of Utahns oppose the president naming Bears Ears region as a new national monument. Coincidence that this statement rings opposite as the statement published in the Salt Lake Tribune on August 11? The new survey was performed by me, a concerned native of San Juan County, who has no funds to hire a professional survey company, such as the Benenson Strategy Group (BSG). I ran my own survey to grasp what polls really entailed. The two surveys were managed by me, with 1,140 responses, and by the funded Pew Charitable Trusts, finalized by BSG with 600 registered voters. Unpaid poll: Explain your relationship to the 1.9 Million Acres of land becoming Bears Ears National Monument: 47.4 percent currently reside in San Juan County; 58.8 percent grew up in San Juan County; 38.7 percent frequently visit San Juan County; 40.3 percent hunt in 1.9 million acre proposed boundary; 37 percent gather firewood in 1.9 million acre proposed boundary; 14.3 percent gather herbs, berries, and medicinal items there; 61.1 percent recreate there and 3.9 percent graze cattle there. Unpaid Poll: Do you support or oppose the 1.9 million acres of land becoming a monument? 96.3 percent oppose; 2.3 percent support. Pew Poll: “As a national monument, the land remains open for grazing, rights of way, hunting, fishing, and other recreational activities, but new development, mining and oil and gas drilling is prohibited. 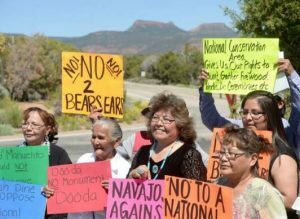 Do you support or oppose the idea to make Bears Ears area in Utah a protected national monument?” Strongly support 27 percent; somewhat support 26 percent; somewhat oppose 13 percent; strongly oppose 27 percent. Unpaid Poll: What is your main ethnic or racial heritage? 7.6 percent (87 people) Native American; 86.3 percent (984 people) Caucasian or white. Of the 87 Native Americans, only one supported the monument. It is assumed that the population agrees that these topics are very important. However, where the Pew survey tilts towards one answer to protect lands, the unpaid survey asks, “Do you support or oppose the Public Lands Initiative (PLI)?”; 43.9 percent undecided; 31.3 percent oppose; 21 percent support; 3.8 percent other. In other words, this company can and will say anything to present the question that favors whatever outcome you desire. Also interesting, the Bears Ears actual area sits ihttp://www.rangemagazine.com/n roughly two square miles. That’s about .0006 percent of the proposed monument. How the designation of calling it Bears Ears National Monument came to be is incomprehensible. Maybe BSG can create a poll asking if the name “Bears Ears, Head, Shoulders, Knees, and Toes, Knees, and Toes, National Monument” should be considered. Devin Bayles Hancock is a native and devoted advocate of San Juan County who opposes the Bears Ears National Monument.